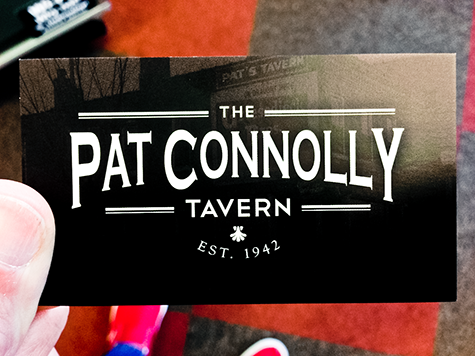 The “New” Pat Connolly Tavern. When I heard my friend Joe was taking back his family’s business, I was super excited. When I bit into his new Buffalo chicken sandwich, I was in heaven. I was even more stoked that he let me do some of his printing for him. Everyone do yourselves a favor and grab a bite to eat at The Pat Connolly Tavern in Dogtown (across from Turtle Park). I’ve had the onion rings (double battered! ), green beans, sweet potato fries, and, of course, the Buffalo chicken sandwich with garlic mayo. It was all divine. The chicken on the sandwich was the most moist chicken on that type of sandwich that I’ve ever had. If you see Joe when you go there, tell him Greg from The Done Dept. sent ya’.